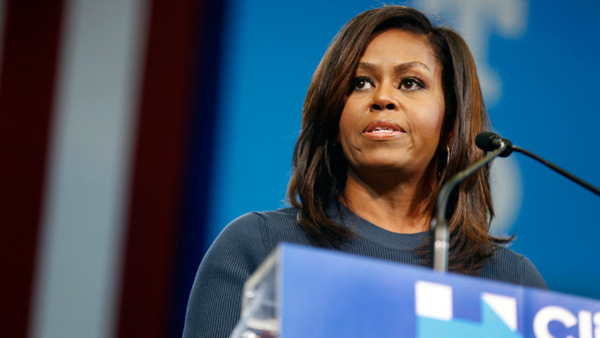 BOSTON -- Michelle Obama has some tough words for women who didn't vote for Democrat Hillary Clinton in the 2016 presidential election, saying they "voted against their own voice." Boston.com reports that the former first lady made the remarks Wednesday during a question-and-answer session with feminist author Roxane Gay at a marketing conference in Boston. Mrs. Obama says she and former Democratic President Barack Obama still support Republican President Donald Trump and want him to be successful. She was critical of Republicans' unsuccessful efforts to repeal Obama's health care law, calling it the "country's legacy." Mrs. Obama says that while she doesn't miss the White House, she does miss the "people and the work." She says she's working on a book about believing in our most authentic selves, and it will include stories about her childhood.